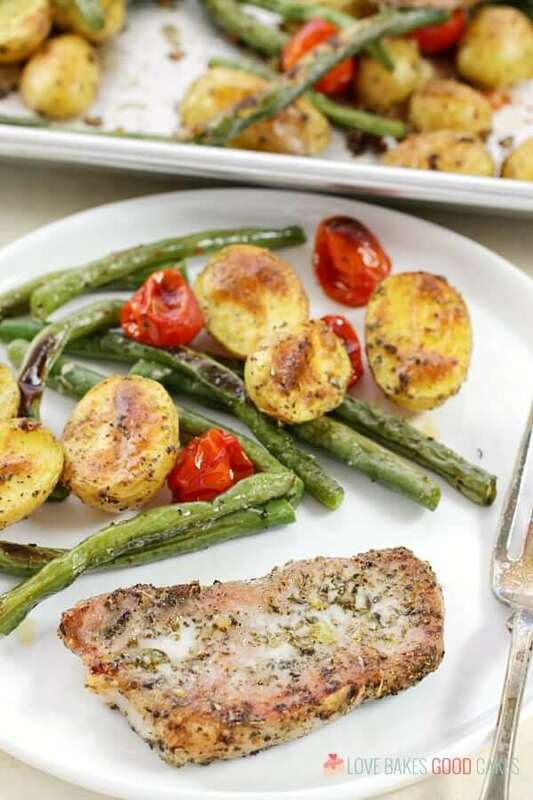 When you need to make mealtime quick and easy, give this Italian Pork Chop Sheet Pan Dinner a try! 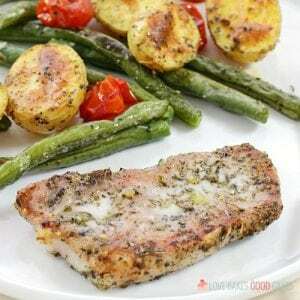 Italian-spiced Pork Chops bake with potatoes, green beans, and tomatoes for a supper everyone will love! Can you believe summer is winding down with some kids already heading back to school?! I’ll be honest, I’m just not ready. For me, summer is all about the freedom of having a looser schedule. Things move at a slower, less hectic pace. It usually involves later bedtimes and sleeping-in in the mornings. I’m not really looking forward to early mornings again. I’m not. The school year always brings jam-packed days with some days leaving me feeling like I haven’t even had a chance to sit down all day, let alone try to think about dinner plans. That’s where Smithfield All Natural Fresh Pork come in! 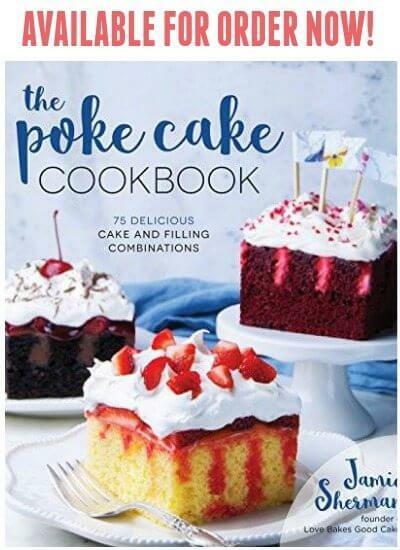 It is available at Walmart and is an easy, everyday option for delicious recipes! 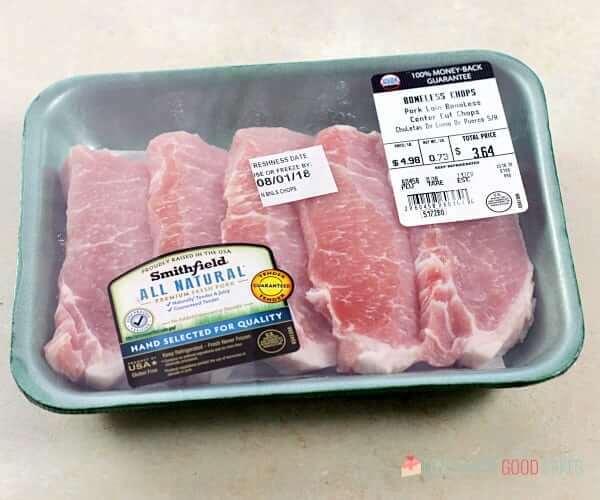 You can prepare it in a slow cooker, grill it (Smithfield All Natural Fresh Pork is great on the grill! 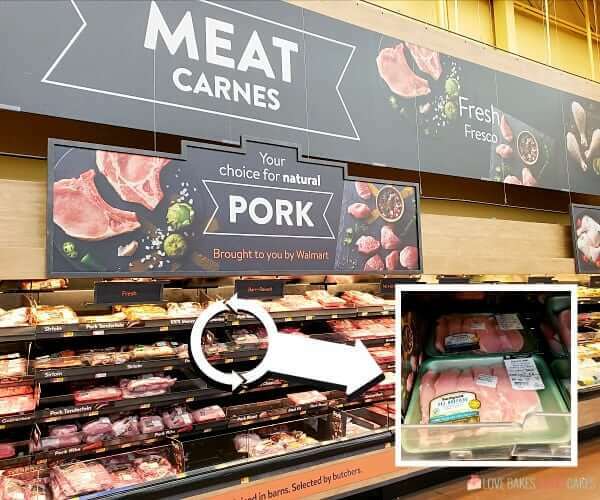 ), roast it, or pressure cook it for a quick, delicious meal that you can feel good serving to your family any night of the week because Smithfield All Natural Fresh Pork is guaranteed tender without added steroids, hormones, or artificial ingredients. You can taste the quality and difference. Smithfield® is guaranteed tender. 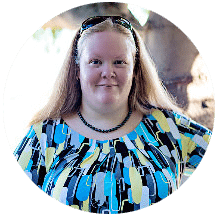 What does guaranteed tender mean? My family loves sheet pan meals. I particularly like how easy they are to make and how little clean-up there is. 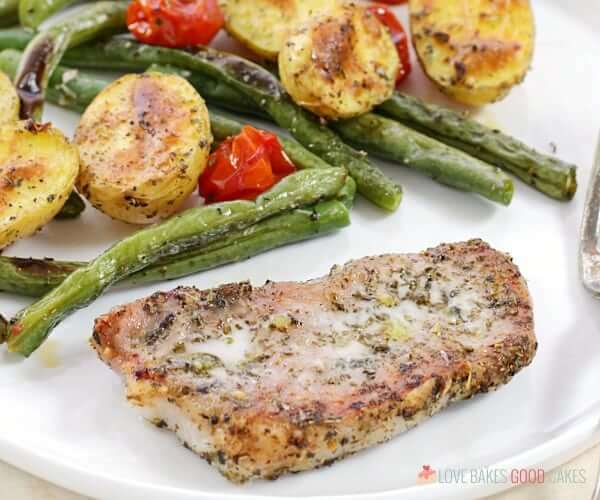 For this Italian Pork Chop recipe, I start by getting the potatoes ready and in the oven while I prepare the rest of the dish. In the time it takes to semi-roast the potatoes, I can rinse off and trim the green beans, rinse the tomatoes, and get the Smithfield All Natural Boneless Pork Chops all seasoned and ready to go. Although I used boneless pork chops, feel free to use Smithfield All Natural Bone-in Pork Chops if you prefer. You may need to adjust the baking time slightly. Be sure to cook pork to a minimum internal temperature of 145 °F as measured with a food thermometer before removing meat from the heat source. One of the great things I love about this Italian Pork Chop Sheet Pan Dinner is that it also makes a great meal prep idea! I love that I can bake everything on one baking sheet and then portion it out into individual servings! Easy peasy. 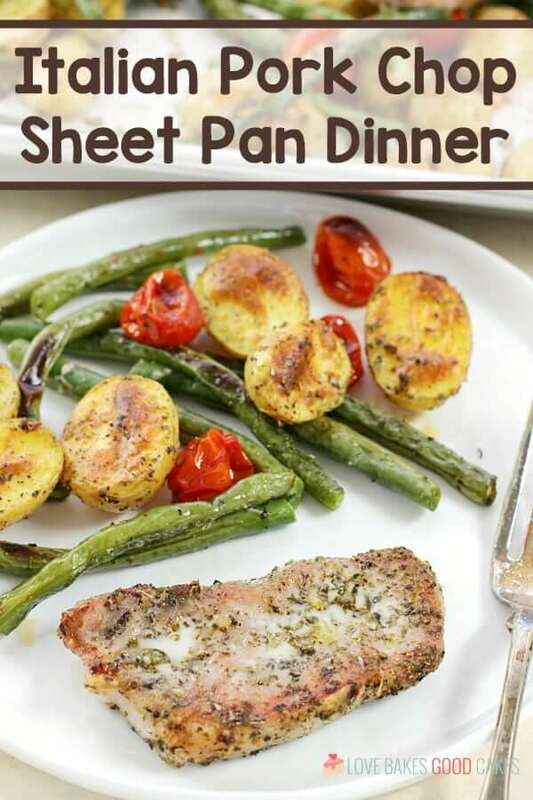 For those nights when I need something even quicker and easier – or when everyone is eating at different times – this sheet pan dinner is a great recipe choice. 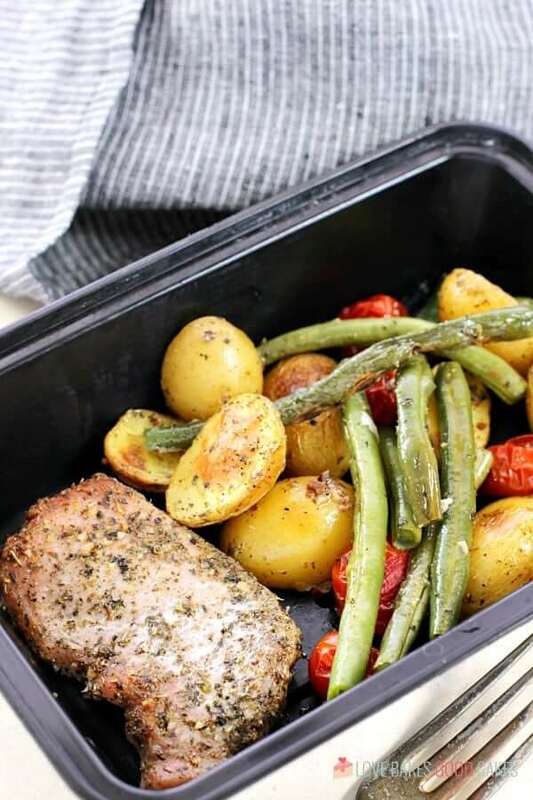 Smithfield® is guaranteed tender, making it the perfect option for a meal prep recipe! Preheat oven to 425°F. Spray a large rimmed baking sheet with cooking spray. Place the potatoes on the prepared baking sheet. In a small bowl, combine olive oil, garlic, Italian seasoning, salt, and pepper. Mix well. Drizzle 1 tbsp. of the mixture over the potatoes. Toss the potatoes to coat. 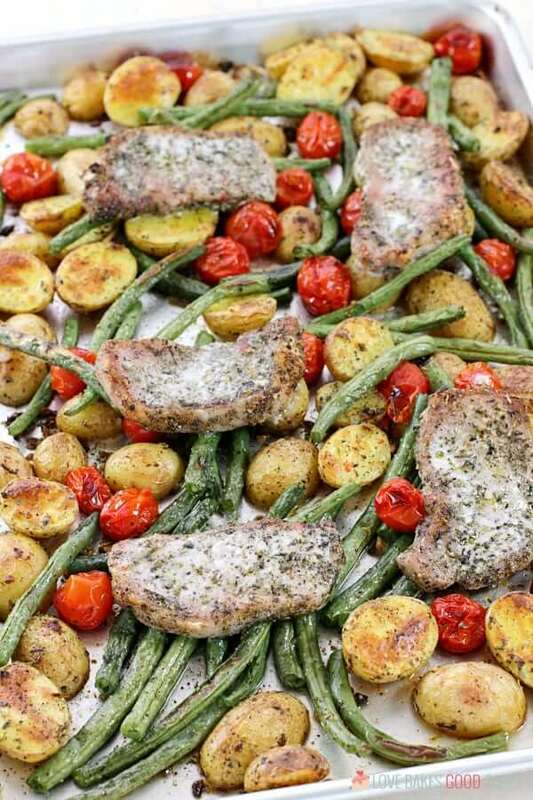 Remove the baking sheet from the oven and add the green beans and tomatoes. Drizzle 2 tbsp. of the olive oil mixture over the top. Toss to coat. Add the Smithfield All Natural Boneless Pork Chops over the top of the vegetables. Pour the remaining olive oil evenly over the pork. 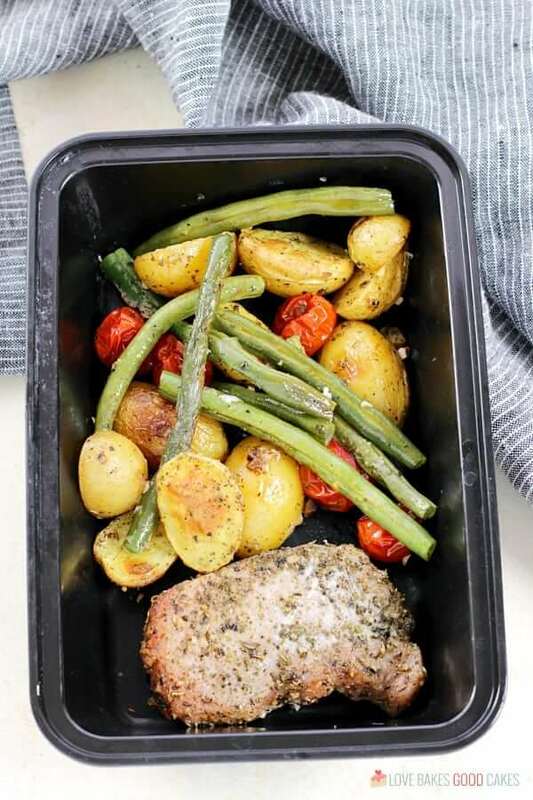 Bake an additional 15-17 minutes or until the potatoes are soft and the pork reaches a minimum internal temperature of 145 °F as measured with a food thermometer. If desired, turn oven control to broil. Broil 4-6 minutes or until pork chops are nicely browned. Cook pork to a minimum internal temperature of 145 °F as measured with a food thermometer before removing meat from the heat source.